The Bitcoin market is waking up but it’s taking a long time for it to go anywhere. 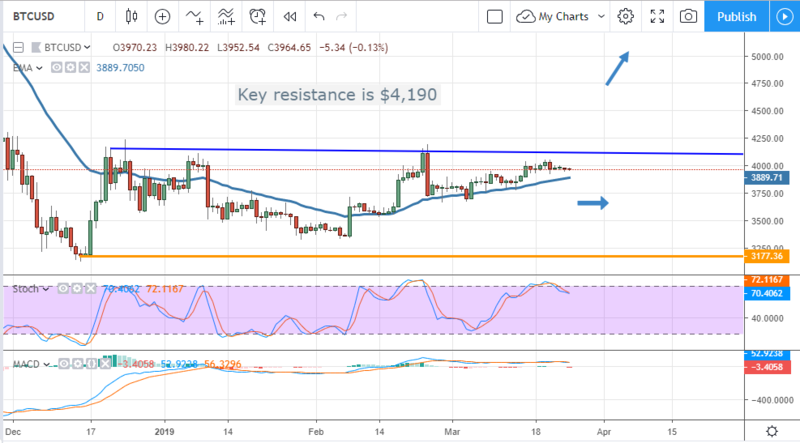 The good news is that the Bitcoin market has been hanging around the $4,000 level after testing support at a moving average. The longer it consolidates at these levels the better. The moving average can push BTC’s prices up to $4,150 very easily and, if I read the tea-leaves right, some recent news and events will help it move higher over the next few months. Last week the Cboe announced it would stop listing Bitcoin futures. The reason is because demand for the product was low and there weren’t enough traders to maintain a liquid market. With Bitcoins price wallowing near long-term lows and still in what is a long-term down trend it would have fallen on such news. The reality is the Cboe’s product is less attractive than one offered by the CME. There are at least two reasons why traders prefer the CME and those are because more traders use the CME than the Cboe and the settlement price was more consistent with major BTC markets. Although the ICE is still waiting to get the OK to launch Baakt it is still out there waiting to rock the market. Baakt will allow physical trading of BTC in an SEC approved manner and atomic swaps of all cryptocurrencies. The platform includes holding and storage facilities, wallets, trading, the whole nine yards. When it gets launched will have things like physically-settled Bitcoin futures instead of the lower-volume and less market-influencing cash-settled options they have now. The SEC said it themselves, a Bitcoin ETF is all but inevitable. The only thing we need is patience. patience can sometimes be bad for the market but not this time. While traders sit there waiting they will hold their tokens while the BTC supply slowly dwindles. At the same time more and more traders will get in as we get closer to a real BTC ETF and that will drive prices to a boiling point. At some time in the not to distant future pressure could build that drives BTC to retest the all-time high. New evidence of market manipulation was found and the market shrugged it off. A study from Bitwise showed that 90% of all Bitcoin trading was wash trading. Wash trading is when an exchange or a whale buys and sells at the same time to generate the appearance of volume. The news comes as no surprise but doesn’t alter the fact traders still want to trade Bitcoin and investors want to own it. It may not be the world’s end-all be-all final solution to cryptocurrency but it is the first, most stable and most widely used.